In the wake of repeal of core curriculum requirement for haredi schools, MK Eichler has some choice words for the requirement's supporters. 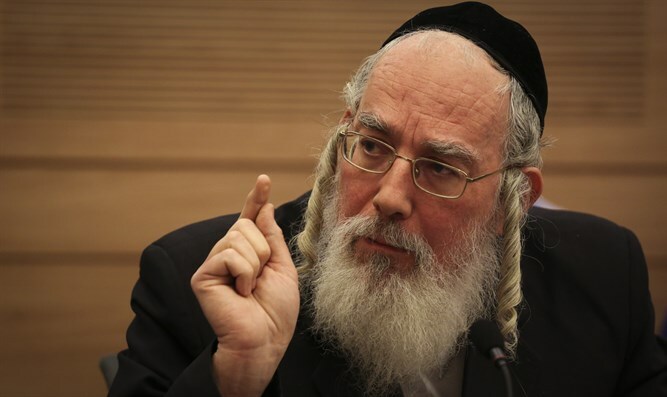 MK Yisrael Eichler of United Torah Judaism (UTJ) spoke to Arutz Sheva about today's (Sunday) decision in the Ministerial Committee for Legislation to repeal the requirement for the core curriculum to be taught in haredi schools. The "core curriculum" consists of basic math, English and science, as defined by government regulation. The decision to repeal the previous law requiring it in haredi schools stems from the coalition agreement between UTJ and the ruling Likud party. "A haredi Jew can't meet the basic criteria needed for any job, the way things are now. He can't even work sticking on stamps in the post office because for arbitrary reasons you need a high school diploma and a degree for everything. Really it has nothing to do with education and just stems from a desire to make it impossible for haredi Jews to live in Israel and stay haredi," Eichler opened. The MK further criticized the motives of advocates of the core curriculum requirement: "They want to devour the lambs, to cause all Jewish children to abandon Judaism. Just last week the Mayor of Tel Aviv declared a war between theocracy and democracy, and spoke of Rabbis in the Religious-Zionist sector as part of the war against democracy. They're fighting against the religion. That's the real battle." MK Eichler was then asked whether he really sees no need for the core curriculum to be taught in order to equip haredi children with the tools they'll need later in life. "They're not really worried about our English. I hear the Knesset Members and senior officials speaking broken English with foreign diplomats. Our haredi people here speak English just as well as they do when they enter the world of commerce. This whole story with the requirement for math and English is just a distraction so they can starve Israel's children." Eichler backed up the last claim by saying that a child in a haredi school receives 30% in government funding of what his counterpart in a non-haredi school gets. "I know there are people who think they don't deserve that 30% either, and not water or electricity either. They want the secular regime to gain complete control of haredi education so that they can uproot all religion. "They really care about the state of mathematical knowledge in our society? They know mathematics? Go and see how many in the secular sector only do the lowest possible math requirement in high school," the MK retorted. Eichler ended the interview with some general words of observation, opining that "the battle here, as the Mayor of Tel Aviv said, is between theocracy and democracy. We're on the side of democracy. We want there to be rule by majority and protection of minority rights. They want a secular dictatorship. "The persecuted haredi minority is battling for its survival. We are in the period of mourning in the Jewish calendar [in proximity to the date of the destruction of the temple], and it appears that Jews were persecuted not only in the past and in exile but also here and now in Israel and we need to live with it and overcome it."